Mycetoma, A Potentially Fatal Flesh-Eating Infection, Is One Of The World's Most Neglected Diseases : Goats and Soda Mustafa Alnour Alhassan is 26. He's dying of mycetoma, a flesh-eating fungal infection. It can be treated — but in poor countries treatment is not readily available. 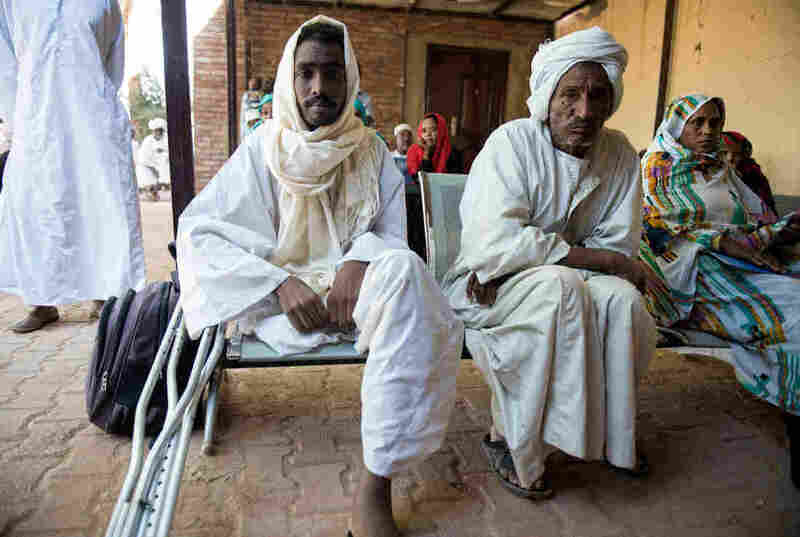 Mustafa Alnour Alhassan, 26, lost his leg to a flesh-eating fungal disease called mycetoma. Here, he sits beside his father, Alnour Alhassan, at the Mycetoma Research Center in Khartoum, the capital of Sudan. "Mashiaat Allah" — It is God's plan. In Sudan, a father utters this Arabic expression as he watches his son die slowly from a flesh-eating fungus. The phrase provides consolation in its acknowledgement that we do not control our fates. But when Alnour Alhassan says it, I feel a pang of indignation. His son Mustafa suffers from an infection that probably would never kill anyone in a rich country. Mustafa Alnour Alhassan has mycetoma, a potentially lethal infection that can be caused by 18 different species of fungi and seven types of bacteria. The fungal version is more common in Sudan — and more debilitating. It happens when fungal spores slip into wounds inflicted by acacia thorns or other objects found in Sudan's arid landscape. The cuts most often afflict people who cannot afford good shoes to protect their feet. When I met Mustafa Alnour Alhassan in Khartoum, Sudan's capital city, in November, he sat beside his father and a pair of crutches. The 26-year-old was dressed in a long, white cotton tunic, a jalabiah. A cream-colored scarf framed his handsome face. Alhassan explained that after graduating from high school in 2008, he noticed a small, infected wound on his knee. But he didn't pay much attention to it. He had other things to think about. His grades had been excellent and, so, his family decided he should be the first to travel from their rural village in southeastern Sudan to Khartoum for college. He decided to study accounting. "He is the first to go to university in our family, I was so proud of him," said his father. "He was always so good at school." Alhassan shared an apartment with other students on the outskirts of the city, but commuting to college became increasingly difficult as his knee swelled. It grew larger than a cantaloupe and was covered in lesions that discharged pus and black grains full of fungal spores. In 2010, a doctor referred Alhassan to the Mycetoma Research Center, a clinic and laboratory founded by a Sudanese surgeon named Ahmed Fahal. With mycetoma, the initial wound heals within a few weeks, but a bump swells in its place. As the fungus's cells multiply beneath the skin, they form small, hard grains that push aside muscles, tendons and bones. Over time, additional bulges form beneath the skin, along with lesions that discharge encrusted seeds of fungus. seminal textbook from the 1950s, Manson's Tropical Diseases, he wrote that patients' limbs sprout "warty outgrowths resembling barnacles," and those tumors, dissected, contain strands "resembling the excrement of earthworms." But almost nothing has been learned about the disease since then because there is virtually zero funding for it — outside of the small amounts of money that Fahal raises for work at the Mycetoma Research Center, with help from the Sudanese American Medical Association. Though the worldwide incidence of mycetoma is not known, in a 2013 report in PLoS Neglected Tropical Diseases, researchers documented cases from 23 countries. Since the Mycetoma Research Center's clinic opened in Khartoum in 1991, 7,210 people have been diagnosed there. At the clinic, doctors prescribed ketoconazole to treat Alhassan. It's an antifungal drug that can cause liver damage and must be taken for more than a year to have an effect. Though a jar of pills costs $45, a huge expense for Alhassan's family, it is cheaper than other options. For four months, Alhassan's brother paid for the medicine with his meager earnings from a supermarket. But the combination of the cost, the stomach pain inflicted by the drugs and the lack of immediate results led Alhassan to stop the medicine and eventually return home. "I was depressed, but this is the plan of God," Alhassan said of having to leave college. Alhassan's family sought out the most respected traditional healer in the region, who diagnosed his ailment as madura foot — an older name for mycetoma. He asked Alhassan to collect 70 old batteries; the healer scraped out the battery acid, mixed it with water and rubbed the paste into Alhassan's wounds. Each of three treatments cost $8. The pain was excruciating, Alhassan said. "I thought it was weird, but he was so confident," Alhassan said. Alhassan had a short period in 2013 where he decided to try college — and the Mycetoma Research Center — again. Doctors prescribed a different antifungal drug, itraconazole, with fewer side effects. But the infection grew worse. Beneath his skin, the fungus hollowed out cavities in his flesh, and devoured his bones. His leg was putrid and stunk. It was an embarrassment in class. After two months with no improvement, Alhassan's family suggested he see a different traditional healer. This time, the healer said to halt the itraconazole and drink herbal potions instead. But the disease only progressed. In July 2015, surgeons associated with the Mycetoma Research Center amputated Alhassan's leg above the knee. But bits of fungus remained in his body. They stretched their filaments through his flesh and spread to his groin and lungs. When I met Alhassan in November, several people in his village were contributing to the cost of his latest antifungal treatment, Voriconazole, which had to be shipped through an informal market from India at great cost — resulting in a price tag of $2,411 for 50 pills. He was on the last jar they could afford, so Alhassan was taking half the required four-pill daily dose in hopes of living a little longer. When Alhassan saw the doctors at the Mycetoma Research Center for a consultation that day, the doctors said they could do nothing more for him. "I had come here to Khartoum to do well for my village, and now I am a burden," Alhassan said. Had Alhassan lived in a developed country, it's unlikely the flesh-eating fungus assaulting his body would have taken such a toll. At a U.S. hospital, for example, doctors might experiment with quality drugs that would modulate the inflammatory response and prescribe a palette of treatments that kill off other fungal infections. A few years ago, global health experts rallied around an initiative to put 0.01 percent of the annual GDP of rich countries into a fund for research on so-called neglected diseases, like mycetoma, that afflict the poor and receive little attention as a result. It did not succeed. Public funding for neglected diseases is currently at a seven-year low, according to a recent report from the health analysis firm G-FINDER. In May 2016, a Geneva-based organization called the Drugs for Neglected Diseases initiative plans to launch the first clinical trial of a drug to treat mycetoma. The study will be based at the Mycetoma Research Center in Khartoum. Even though the budget is tiny, the center's director, Fahal, is elated. "I've been waiting for this for 30 years," he tells me. He has seen too many patients like Alhassan. He has conducted too many amputations. He hopes that next year brings change. Freelance writer Amy Maxmen traveled to Sudan to write a series of articles on mycetoma for Global Health NOW at the Johns Hopkins Bloomberg School of Public Health. You can tweet her at @amymaxmen.